...pshhhh...The babe has issues! if she is so mad, why is she still using his name??? Looks like someone is looking for a little attention. As if those awwww boys will exist without the man in middle? She obviously still has feelings for Usher. Eya, poor woman. crazy bitter heifer...pls usher did ur sorry self a favor so be thankful you got him for 18years. we all knew this was a huge train wreck waiting to happen the moment we started seeing y'all together. 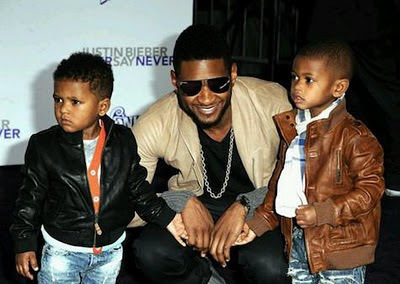 stupid hoodrat...usher is the best thing that ever happened to you.didn't this whore have 3 kids, by 3 baby daddies before hitting the jackpot with usher? She's obviously got issues. Dissing the very guy that pays the bills even while they are divorced i.e. alimony now. She's got to be some kind of drama queen. I blame Usher for falling into her trap jare! There are lot of good single women out there. 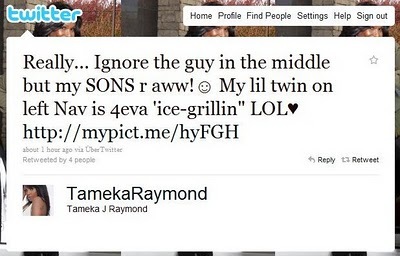 The kids are here now and she shouldn´t insult her kids father like that in public. Twitter and facebook has become some sort of a medium to get attention these days. Funny how she's still using the man in the middle's last name! I think we should show some sensitivity towards this woman. I will be bitter if the media went after me the way they did to her, and then for the marriage to end too. It's not easy at all. Maybe her and Usher just got into an argument before the event, you don't know what people are going through inside. well that might be true but life is like that, u get what u throw out. u tweet words like that, who is going to open your head to find out what u are going thru?